Inspired by the Felicity Hat designed by Brooklyn based crafty queen Wanett Clyde, I am presenting to you the Nettie Hat. 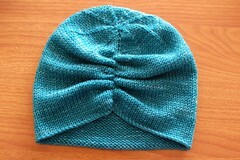 Special thanks to Wanett Clyde for granting me permission to publish the Nettie Hat for free here on Getting Purly With It. 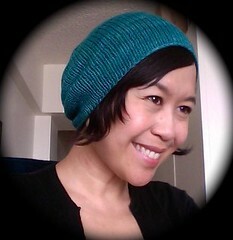 Wannet’s Ravelry name is “Nettie” and to honor her I named this hat after her! 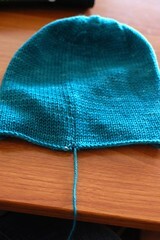 I think the Nettie Hat version 1 is pretty straightforward; in the round, decreasing for top, and there you have your hat. 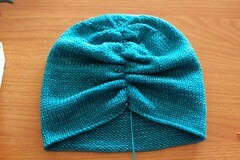 Nettie Hat version 2 might need a mini picture tutorial, so here we go! 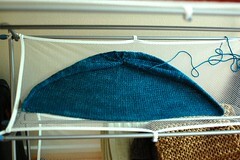 In the above picture my piece is laying flat to dry because I wet blocked it. I always wet block my pieces, you don’t have to if you don’t want to. Wet blocking is optional but I have to say, it does eliminate somewhat the curling of the edges since this piece is knitted in stockinette stitch. If you don’t know how to do the mattress stitch, go to Knittinghelp.com, click on their “tips” tab, scroll down until you hit “mattress stitch” and watch the video. How far to bunch it up is all up to you. Do a little bit, see how you like it and if you want some more ruching, go ahead and bunch it up some more. 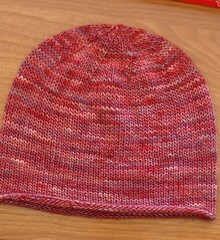 This hats needs 140 yards of light worsted weight or heavy DK weight yarn. Venezia worsted by Cascade, Malabrigo Silk Merino, Madeline Tosh DK, and Cotton/Bamboo by Classic Elite. 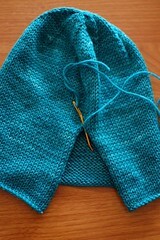 I think it is especially nice when you use somewhat slouchy fiber such as silks, cotton, bamboo mercerized cotton, rayon. Great since we are heading into warmer weather! And now for the PDF files! 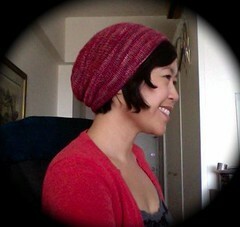 I am leaving you with a slide show of all the yarns I used to make the Nettie Hat. Have fun with your Nettie Hat! Wheeeeee!